Today, feathers are an extravagant accessory in fashion; 500 years ago, however, they were used to constitute culture, artistry, good health and even courage in battle. This unlikely material is now part of a project that promises to tell us more not only about what happened in the past, but also about how it felt to be there. Historically, feathers were an incredibly expressive accessory for men. Nobody has really looked at why this was the case. That’s a story that I want to tell. The assassination of Archduke Franz Ferdinand on 28 June 1914, had such seismic repercussions in precipitating the First World War that it is easy to disregard the curious little detail of feathers on the floor. In such context, they seem trivial. Rewind a few moments more, to the famous final photograph of the couple leaving Sarajevo town hall, and the plumage sprouting from the Archduke’s hat looks positively absurd; as if amid all the other mortal perils of that day – the bomb that narrowly missed his car, the bullets from a semi-automatic – he somehow also sustained a direct hit from a large bird. Today, we generally associate feathers with women’s fashion, and a peculiarly ostentatious brand at that, reserved for Royal Ascot, high-society weddings and hen parties. Among men, wearing feathers is typically seen as provocatively effete – the domain of drag queens, or ageing, eyelinered devotees of the Manic Street Preachers. Yet a cursory glance at military history shows that Franz Ferdinand was far from alone in his penchant for plumage. The Bersaglieri of the Italian Army, for example, still wear capercaillie feathers in their hats, while British fusiliers have a clipped plume called a hackle. Cavaliers in the English Civil War adorned their hats with ostrich feathers. Rublack is beginning to study the use of featherwork in early modern fashion as part of a project called ‘Materialized Identities’, a collaboration between the Universities of Cambridge, Basel and Bern, and funded by the Swiss National Science Foundation. To the outsider, its preoccupations (her co-researchers are studying gold, glass and veils) might seem surprising. Yet such materials are not just mute artefacts; they sustained significant economies, craft expertise and, she says, “entered into rich dialogue with the humans who processed and used them”. Critically, they elicited emotions, moods and attitudes for both the wearer and the viewer. In this sense, they belonged to the ‘symbolic universe’ of communities long since dead. If we can understand such resonances, we come closer to knowing more about how it felt to be a part of that world. Rublack has spotted that something unusual started to happen with feathers during the 16th century. In 1500, they were barely worn at all; 100 years later they had become an indispensable accessory for the Renaissance hipster set on achieving a ‘gallant’ look. In prosperous trading centres, the locals started sporting hats bedecked with feathers from parrots, cranes and swallows. Headgear was manufactured so that feathers could be inserted more easily. By 1573, Plantin’s Flemish–French dictionary was even obliged to offer words to describe people who chose not to wear them, recommending such verbiage as: ‘the featherless’ and ‘unfeathered’. Featherworking became big business. From Prague and Nuremberg to Paris and Madrid, people started to make a living from decorating feathers for clothing. Impressive efforts went into dyeing them. A 1548 recipe recommends using ashes, lead monoxide and river water to create a ‘very beautiful’ black, for example. Why this happened will become clearer as the project develops. One crucial driver, however, was exploration – the discovery of new lands, especially in South America. Compared with many of the other species that early European colonists encountered, exotic birds could be captured, transported and kept with relative ease. Europe experienced a sudden ‘bird-craze’, as birds such as parrots became a relatively common sight on the continent’s largest markets. Nor were feathers worn by the powerful alone. In 1530, a legislative assembly at Augsburg imposed restrictions on peasants and burghers adopting what it clearly felt should be an elite fashion. The measure did not last, perhaps because health manuals of the era recommended feathers as protecting the wearer from ‘bad’ air – cold, miasma, damp or excessive heat – all of which were regarded as hazardous. During the 1550s, Eleanor of Toledo had hats made from peacock feathers to protect her from the rain. Gradually, feathers came to indicate that the wearer was healthy, civilised and cultured. Artists and musicians took to wearing them as a mark of subtlety and style. “They have a certain tactility that was seen to signal an artistic nature,” Rublack says. Like most fads, this enthusiasm eventually wore off. By the mid-17th century, feathers were out of style, with one striking exception. Within the armies of Europe what was now becoming a ‘feminine’ fashion choice elsewhere remained an essential part of military costume. Rublack thinks that there may have been several reasons for this strange contradiction. “It’s associated with the notion of graceful warfaring,” she says. “This was a period when there were no standing armies and it was hard to draft soldiers. One solution was to aestheticise the military, to make it seem graceful and powerful, rather than simply about killing.” Feathers became associated with the idea of an art of warfare. They were also already a part of military garb among both native American peoples and those living in lands ruled by the Ottomans. Rublack believes that just as some of these cultures treated birds as gods, and therefore saw feathers as having a protective quality, European soldiers saw them as imparting noble passions, bravery and valiance. In time, her research may therefore reveal a tension about the ongoing use of feathers in this unlikely context. “It has to do with a notion of masculinity achieved both through brutal killing, and the proper conduct of war as art,” she says. But, as she also notes, she is perhaps the first historian to have spotted the curious emotional resonance of feathers in military fashion at all. All this shows a sea-change in methodologies: historians now chart the ways in which our identities are shaped through deep connections with ‘stuff’. Further work is needed to understand how far these notions persisted by 1914 when, in his final moments, Franz Ferdinand left feathers scattered across the car floor. 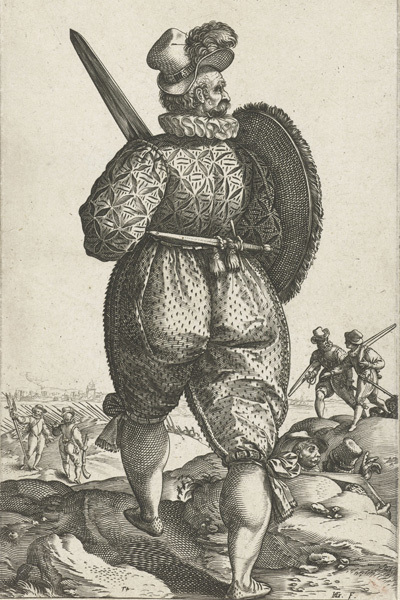 Inset image: Hendrick Goltzius, soldier, c. 1580; credit: The Rijsmuseum, Amsterdam.